For all wing lovers who are looking for a healthy alternative to this favorite food, these cauliflower wings are an absolute must! The wings themselves only have three ingredients – 1 head of cauliflower, olive oil, and salt. The wings on their own are a welcome light treat but, for true wing flavor, the fantastic Buffalo Yogurt dip is an essential accompaniment. This recipe serves 8 and can easily be doubled if serving company or bringing to a gathering. Be sure to share this recipe with friends and family on Facebook, Pinterest, Instagram, and Twitter. We think they’ll love it! Begin by breaking the cauliflower florets off the core and leaving as much of the stem on as possible so the florets resemble little trees or drumsticks. Place the florets in a large bowl and toss gently with 2 tablespoons of olive oil and salt. Use the remaining tablespoon of olive oil to oil a roasting pan and then spread the cauliflower in a single layer in the pan and roast in the oven for about 25 to 30 minutes. Meanwhile, mix all the ingredients for the Buffalo Yogurt dip - Cabot Plain Greek Yogurt, apple cider vinegar, your favorite hot sauce, Worcestershire sauce, salt, pepper, and garlic - in a medium own until well blended. Serve roasted cauliflower with this dip and it’s guaranteed to be gone in no time! 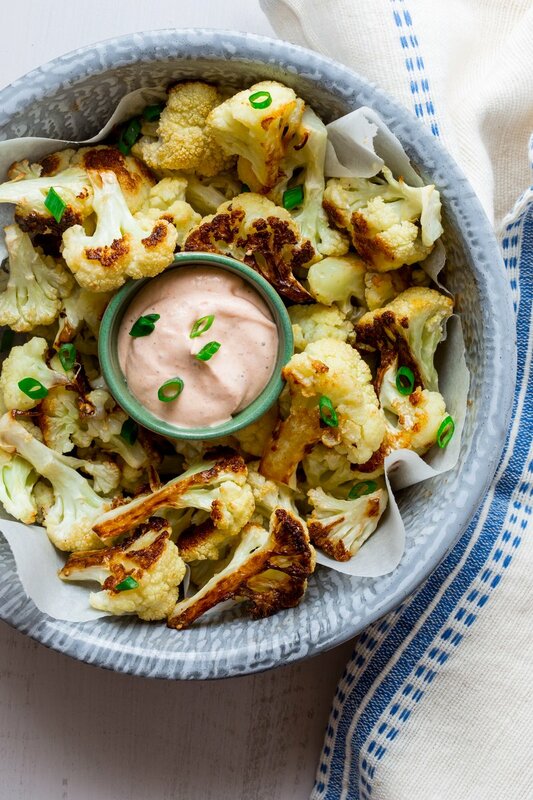 Looking for another great cauliflower appetizer? Check out our Cheesy Cauliflower Tots. 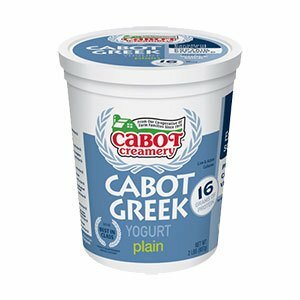 As a cooperative of over 800 farm families, Cabot is committed to creating the highest quality products and recipes that best showcase the fresh flavors of our dairy products. Please share your thoughts about our Roasted Cauliflower Wings with Buffalo Yogurt Dip after you’ve tried it by rating and reviewing it. We’d love to hear what you thought! CUT or break the cauliflower florets off the core leaving as much of the stem on as possible. They should resemble little trees or drumsticks. Place the florets in a large bowl and toss gently with 2 tablespoons of the olive oil and salt. Lightly oil a roasting pan or sheet pan with the remaining tablespoon of olive oil and spread the cauliflower in a single layer in or on the pan and place in the oven. ROAST for 25 to 30 minutes or until the cauliflower just starts to get tender and the edges start to turn nice and brown. MIX all of the dip ingredients in a medium size bowl until well blended. ARRANGE the roasted cauliflower on a serving platter with a bowl of the dip on the side. Enjoy!